These days much of our communication happens electronically and quickly. It’s easy to send off a text whenever a thought strikes. It’s clear to see why one might think handwritten thank-you notes have gone the way of the manual typewriter. For now, however, handwritten thank-you notes are still a must for every gracious bride. If you’re worried the task of handwriting thank you notes for all your wedding gifts will be overwhelming, don’t worry. You will probably spend less time writing thank-you notes than you will spend returning gifts you can’t use or don’t want. Here are a few quick tips to get you excited about writing thank-you notes. And if not excited, maybe less depressed. 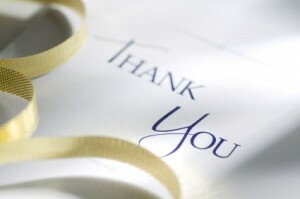 Stationery – Visit a stationery shop and select cards that express both your thanks and your personality. There are endless designs to choose from. Once you have a set of lovely cards, note-writing might seem just a little less arduous. The bones – Every thank-you note should acknowledge the giver. The best way to do this is to write their name after the word “Dear” at the top of your card. Next acknowledge and express gratitude for the gift. Share how you see it fitting into your life, or how you plan to use it. Make a quick mention of the past (It was good seeing you at my bridal shower) and of the future (I’m looking forward to chatting with you more at lunch next week). Finally, close with your signature. Make it personal – Don’t be afraid to add your own personal voice to your handwritten thank-you note. Just because a thank-you note is a more formal way of communicating doesn’t mean you have to don a mask of stoicism. While it’s never okay to be rude or say something disparaging about the gift, it’s perfectly okay to use humor. Imagine yourself talking to the person to whom you are writing and let your written thanks flow from there. Don’t lie or embellish – Do you know for a fact you will never use the electric egg poacher Aunt Marge got you? Don’t lie and say how much you love it. You should, however, thank Aunt Marge for her thoughtfulness. Conversely, don’t needlessly pile on praise for things you like–unless it truly is the most stunningly beautiful blender you have ever seen. Pace yourself – If you have a big list of people to thank, commit to a manageable number of note cards each day. You might be surprised at how much easier it gets to write thank you notes the more you practice. Soon, your stamped cards will be in the mail and grandmas and old aunts everywhere will be praising your good manners and class.